Elvis Presley died on August 16, 1977 and the 35th anniversary of The King’s death arrives this coming week. GLOBE Print Edition, August 20th gives readers an amazing retrospective on the most important and influential popular entertainer of all time. But GLOBE doesn’t limit themselves to reminding us about how great Elvis was, they explore in detail how great he would continue to be had he lived. We learn all about what Elvis would be up to today. GLOBE presents the insights and opinions of the people who knew Elvis best to develop a convincing portrait of Elvis Presley at 77 years of age – Elvis as a senior citizen! The King’s stepmom, Dee Presley, gave an exclusive interview to GLOBE in which she reveals never-before-heard secrets about Elvis. Dee reveals exactly how Elvis was in the process of turning around his life and cleaning up. She goes into detail on what Elvis would look like today and GLOBE’s skilled technical staff have produced a convincing computer generated portrait of The King at 77. GLOBE examines what Elvis’ career trajectory would have been in today’s information age and believe me, it is impressive! Elvis’ good buddy and Hollywood veteran, Michael St. John, helps paint a clear picture of what Elvis’ life would be like in 2012. Michael explains how Elvis would have teamed up with such luminaries as Paul McCartney and Tom Jones to thrill audiences worldwide. We learn how Elvis would not only be delighting his original fans, but winning millions of new ones, with important Hollywood film roles. 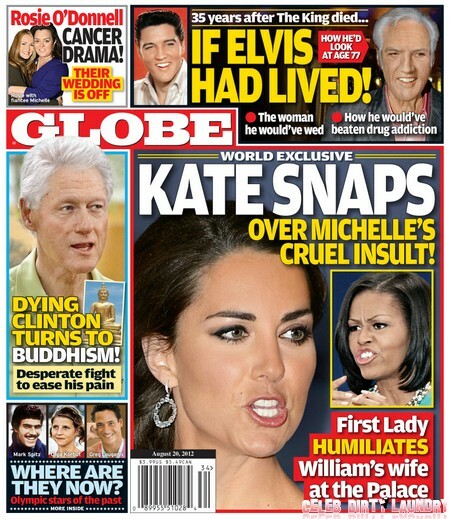 GLOBE explores what Elvis’ love life would be like today and reveals the lady he was in love with at the time of his death. This GLOBE article was a revelation to me. As I read all about The King and looked at his very realistic computer generated portrait I could easily imagine that Elvis was alive and thriving today. GLOBE provides both a wonderfully nostalgic trip down memory lane and a vivid look at what Elvis Presley’s life would be today. Every Elvis fan needs to read this week’s GLOBE – and any of you too young to remember how great he was can take this opportunity to learn all about why Elvis Presley will forever be called The King. Elvis Presley’s Crypt is For Sale!